Welcome back to the Spring edition of the Wacky Watercooler Blog Hop! We’re so glad to have you back with us for another inspiration-filled hop, featuring stamps & products from all of the current catalogues – including the Annual, the Occasions and the Sale-a-bration brochure. We’re staying with a Spring theme this time; while the weather here on the West Coast has been quite mild and sunny, I think practically all of the rest of the world is very tired of winter! If this is your first blog hop with us – no worries! All of the participating blogs are linked to each other in a circular fashion, so whether you click ‘next’ or ‘previous’, you will travel in a circle, and see all of the amazing projects we have for you! If you’d rather randomly hop about, you can use the list of blogs, at the bottom of this post. We have started a new ‘tradition’ of having our names randomly chosen by another blog participant, and we choose one of their past projects to ‘CASE’ (Copy And Share Everything). This has been a lot of fun for us; I hope you’re enjoying seeing past and current versions, too. For this hop, I was thrilled to have Marsha Reed to CASE. If you haven’t visited Marsha’s blog before – you’re in for a real treat! Isn’t this card gorgeous? The bling, the shine – and that butterfly! It’s made from Washi Tape!! Bet you didn’t know that! 🙂 Yup! 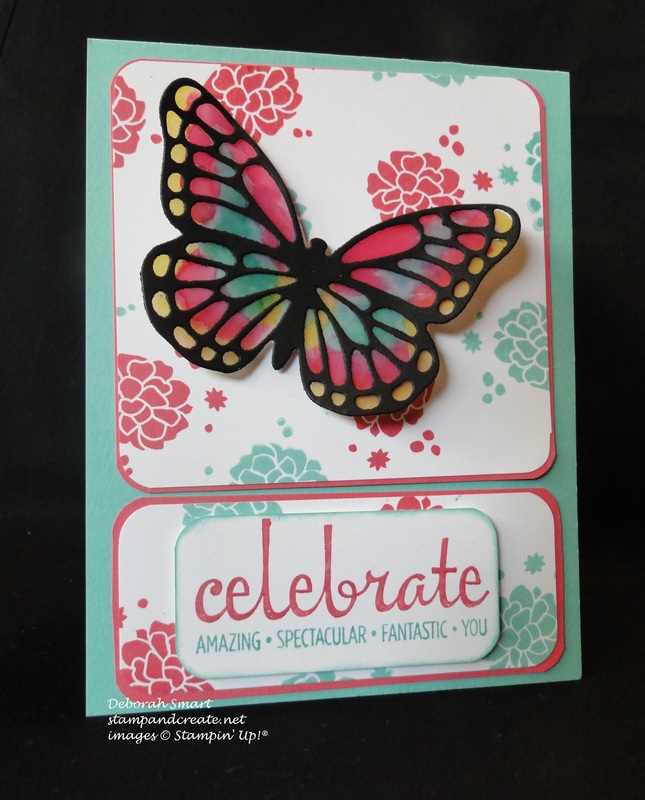 So, now you know one of the reasons why I chose this card to CASE – I wanted to try making the butterfly! I knew I wanted to keep it bright, since we are doing a Spring theme, after all. I didn’t have any current Washi Tape in the right colours, so I used some retired Gingham Gardens washi tape to make the butterfly. I tied the center of the butterfly using the Thick Baker’s Twine in Strawberry Slush. I used the Hello You Thinlits Die and cut the ‘Hello’ twice; once in Strawberry Slush and once in Whisper White card stock, then layered them just a bit offset. I stamped the ‘Spring’ in Strawberry Slush ink using the Crazy About You stamp set, then cut it out using the Bitty Banners Framelits. I created the larger banner shape behind it by tracing the Framelit onto a piece of Strawberry Slush card stock, then cutting it out using my Paper Snips. How do you like the embossed Silver Foil card stock? 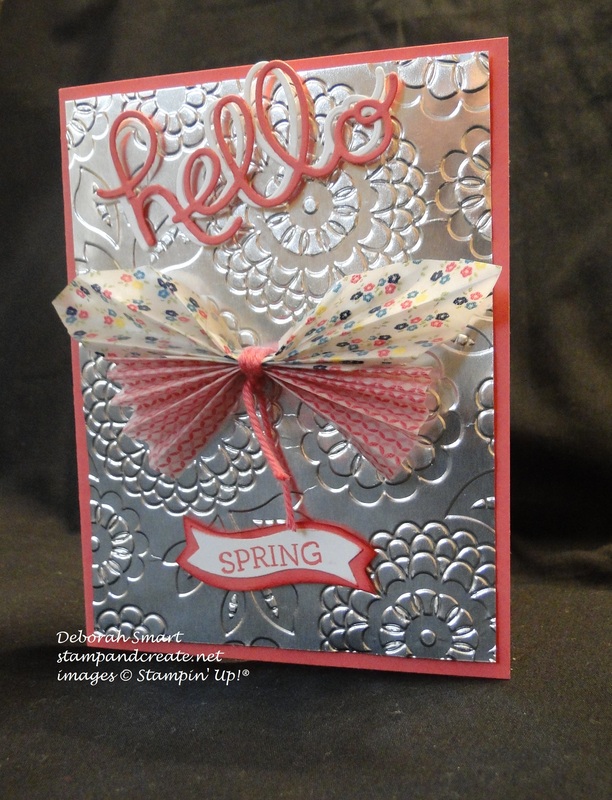 I used the Lovely Lace Embossing Folder – I think the design is great for the Spring theme 🙂 I layered everything onto a card base of Strawberry Slush; I think this card looks appropriately ‘spring-y’, and a pretty good CASE of Marsha’s card! For my next project, I decided to go with a 3D project, with an Easter theme. I haven’t used my Curvy Keepsake Box Thinlits since Christmas, and I’ve been itching to bring it back out! Isn’t this cute?! 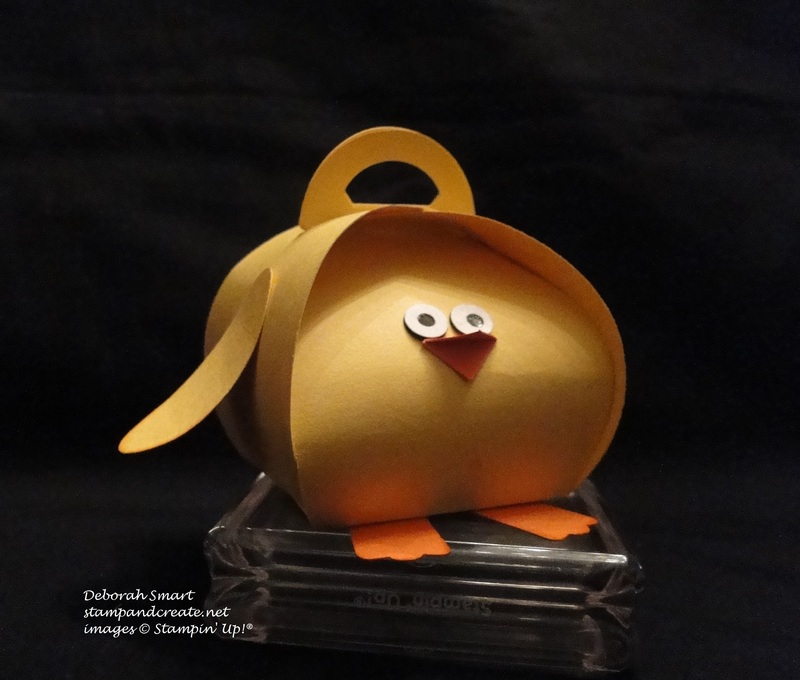 And so easy – I can see me making enough of these for everyone’s place at the dinner table for Easter 🙂 I simply cut the Curvy Keepsake Box in Daffodil Yellow card stock, and assembled it. I made the wings using Large Oval Punch, and the feet were punched using the Modern Label punch, from Pumpkin Pie card stock. The beak, also from Pumpkin Pie card stock, is a small hand cut square, folded diagonally to make a beak. I used the Owl Builder Punch for making the eyes from Basic Black & Whisper White card stock. I think to ‘dress up’ this little peep for Easter dinner, I’ll add a tag with each person’s name on it, and maybe use my Fringe Scissors on the wings. That’s it – an easy peasy decoration that will also hold some chocolate treats – that can’t be beat! My final project is a card that can be used for any happy occasion – a birthday, a congratulations, or ‘just because’ kind of card. Instead of using Designer Series Paper, I made my own background by using the Perpetual Calendar stamp set and stamping the flowers in Coastal Cabana and Strawberry Slush onto Whisper White card stock. Isn’t that so bright & pretty?! Well, you can’t have spring without a butterfly, so I pulled out my Butterfly Thinlets, and cut the medium sized butterfly from Basic Black card stock. (what would I do without my Big Shot?! I shudder to think of it!) I knew I wanted some colour with my butterfly, so I took the cut-out silhouette of the butterfly, and traced it onto a piece of Vellum Card stock. After cutting it out with my Paper Snips, I pulled out my Strawberry Slush, Coastal Cabana and Daffodil Delight inks and my Aqua Painter, and did some watercolouring. I love the look with the Basic Black outline layered on top. I used a card base of Coastal Cabana, and layered the stamped Whisper White panels onto Strawberry Slush card stock panels. The sentiment is stamped using the Fabulous Four set; I achieved the 2 different colours by using my Stampin’ Write Markers to colour the letters. I hope you’ve enjoyed my projects for this Spring Fever version of the Watercooler Hop; I’d appreciate it if you have time to leave a comment, to let me know you were here, and what you think of my projects. I love reading all of your comments! To head forward over to Stefanie’s blog, just click the ‘Next’ button below. If you’d like to go back and check out Heidi’s projects (and no one would blame you! ), just click the ‘Previous’ button. If you’d like to order any of the products I’ve used in making these projects, you can click on the images below, & be taken to my online store. Until next time – enjoy the Hop, and happy stamping! Previous Previous post: CCMC344 – Create with Connie & Mary Colour Challenge! Debra, beautiful projects. The “metal butterfly” is very dramatic. The chick is just darn cute. Thanks for the fun ideas. I need to make a chick box, yours is so cute. Your projects are wonderful. What fun projects. I’m going to have to give that washi tape butterfly a try! Wow, delightful Spring projects and your choice of CAS was wonderful. Such talent. I really like the washi butterfly, and the chick is so cute. I want to try that out too! TFS Deb. Thank you, Penny! It’s so wonderful to have you with us in the Hop; I hope you’ll play along lots more! A very CASEable post Miss Deb. Or should I say you really know how to CASE the joint! I love your CASE of Marsha’s butterfly with a Spring theme. The embossing from the folder really adds pop in the silver and the butterfly and thinlit words are perfect. The easy peasy chick is too darling for words. And so doable. I can see that die in my future now! And thank you for solving the mystery of the vellum inserts I’ve been seeing behind the butterflies. I had no idea they had to be hand cut. Brilliant to use the vellum and add a touch of watercolor for some beautiful butterfly inspired color. A very inspiring set of projects my friend. I can’t wait to see what the others have in store as well. 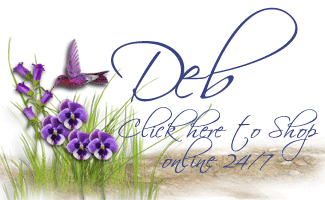 Hugs and love – J.
Hi, Deb, what wonderful projects! 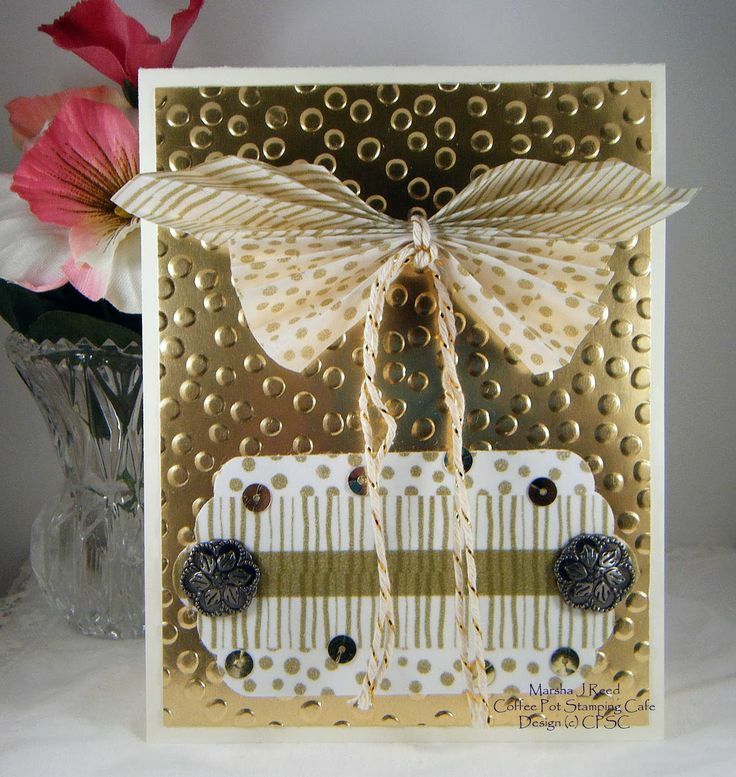 I loved Marsha’s card and your CASE is so different in its Spring-like feel. That embossing folder is beautiful as your background and I have to make the butterfly. I said that before when I saw Marsha’s, but I am going to have to make your very colourful and happy version. I own that Washi tape, after all. I love the Curvy Keepsake box, too, and have seen some chicks made with it but yours takes the prize. Those darling little wings just do it for me. And now for my favourtie, your rainbow butterfly card. I love the way you’ve created the butterfly as well as that pretty background paper. The Perpetual Calendar stamp set is certainly versatile. Thanks so much for being part of the Blog Hop. I’m seeing lots of possibilities with the Perpetual Calendar stamp set now, Heidi. I’m glad I can find more uses for it – it has so many great little stamps that are perfect for making backgrounds! Have fun with the Washi Tape butterfly – I was pleasantly surprised that it was so easy to make 🙂 Thanks for coordinating these Hops for us, Heidi – you do a fabulous job! As usual, your projects are wonderful. Love the little “chick”. Another Easter basket idea. I love the embossed “metals”. They add just the right touch. Your CASE is so pretty. One of the reasons I love these hops is because of the ideas I get and I would never have thought of cutting that butterfly from black. When you look at love ones, many of them do have black outline. Your watercoloring just makes a beautiful “flutterby”. Nice job, Deborah! I love your little chick and your cards are beautiful! So cute, Deborah. The cards are lovely – and I do love that Strawberry Slush/Coastal Cabana combo. What am I going to do in June when Coastal Cabana is gone? I hate to even think about it. Love, love LOVE that little chick. Too cute. You rock, Girlfriend! Great job! I love Your embossing and the various butterflies too! That silver foil really takes to embossing, doesn’t it Stefanie?! Quite the eye-popper 🙂 Thanks for your comment! Deb you have such a free sense of style. Always enjoy looking at your projects. Well, thanks, Bev! What a nice compliment 🙂 It’s a joy being part of the Watercooler gang with you! Loved your take on the butterfly, Deb! Great projects!